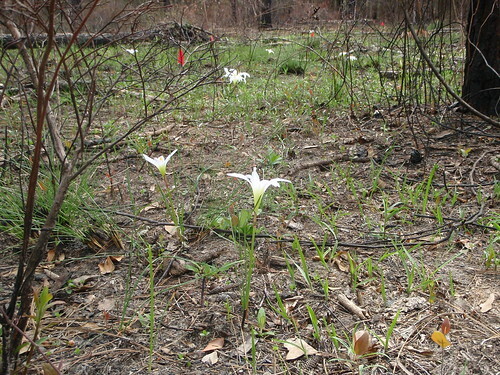 You may know these as Easter lilies, or "those lilies that grow in the ditches by the road in the spring." 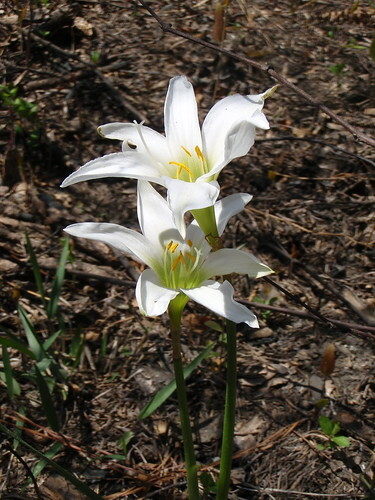 It turns out their real name is Treat's Rain Lily, and they are a native of south Georgia and north Florida, plus a bit of Alabama, and don't grow anywhere else. We've seen them in Georgia counties along the Florida border as far west as Cairo, but not any farther north. Here's much more about these lilies. The red flags mark where we transplanted some longleaf pine seedlings. Pictures by Gretchen Quarterman, 2-3 April 2010, Lowndes County, Georgia.